It’s been a great summer in Ireland this year so far. Usually it would have been raining solid for weeks at a time by now, but we’ve had relatively good weather over the summer, and the last week in particular has been beautiful. It hasn’t been too dry either though, with occasional rain showers. 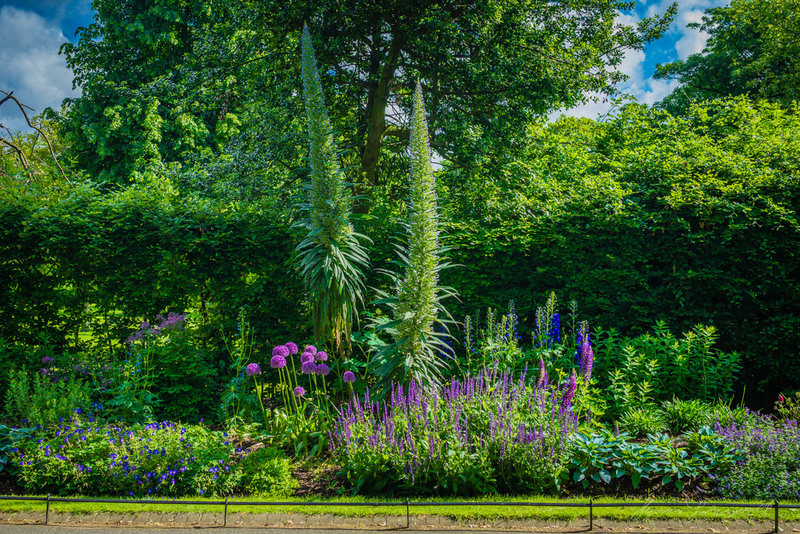 The upshot of all this is that there are some spectacular flowers in the parks around Dublin at the moment, and in my favourite park, St. Stephen’s Green, the flora is positively blooming! I’ve been wandering through the park every chance I get, trying to capture some of the beautiful flowers and scenery. Over the last few weeks I’ve been using every different camera and lens combination I can think of to shoot the flowers. My little Sony NEX–7 has been great. With its flip up screen I’m able to get really low. This has helped for getting flower’s eye view shots of daisies and other low flowers. Also, the resolution and colour depth of the Nex is great for capturing detail. I’ve also been using my trusty D700. The D700 is great for nature shots, because of it’s smooth rendition of green tones, and it’s generally noise free looks. It has a certain quality to its images that’s hard to quantify, but I love the results. Coupled with the always versatile 28–300 it’s been prefect for getting close ups as well as wide shots of the flowers.